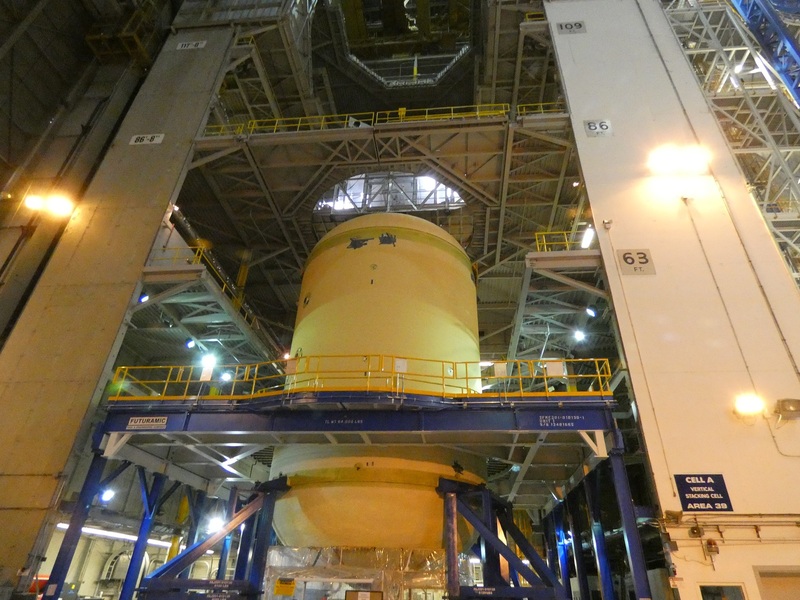 A traffic jam of NASA Space Launch System (SLS) Core Stage hardware that needs to be assembled is building at NASA’s Michoud Assembly Building (MAF) in New Orleans. Completed subsections of the first vehicle and structural test articles (STA) are lining up to be put together at the same time as structures for the second vehicle are ready to begin welding in the same area. Prime contractor Boeing is working with NASA to get the right pieces through the plant in the best sequence possible. 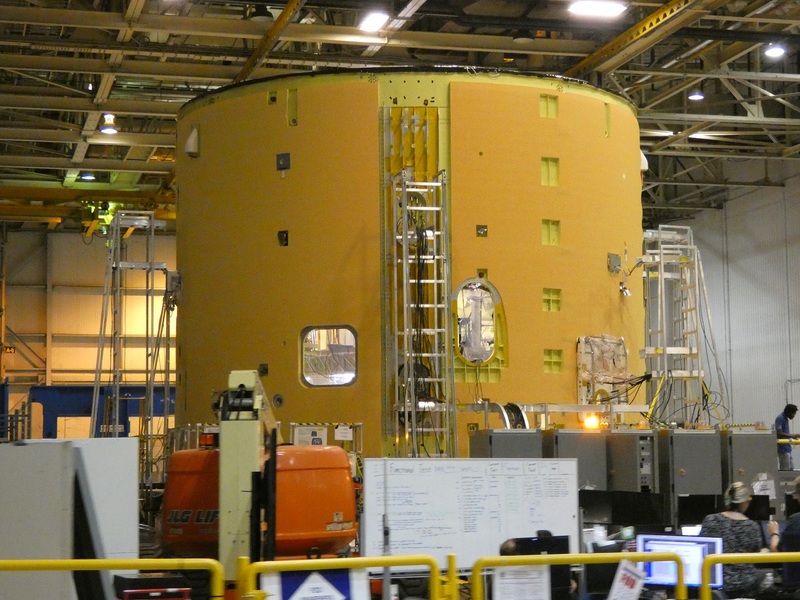 A lot of first-time work remains for the first vehicle and test hardware, so Boeing and NASA are shuffling tanks and re-sequencing work schedules while finishing with configuring other buildings and readying the facility for long-term stage production. While the engine section continues to pace delivery of the first flight stage, Boeing and NASA are also working to optimize work schedules for other parts of Core Stage-1 (CS-1) and test hardware that will support the first SLS launch on Exploration Mission-1 (EM-1), forecast now in mid-2020. Currently, the top half of CS-1 and the liquid hydrogen (LH2) STA are finishing work leading up to their assembly. Even without its engines installed, Core Stages will stretch to around 200 feet in length. That’s too long to stack everything vertically in one place at MAF, so the five main pieces (the forward skirt, the liquid oxygen tank, the intertank, the liquid hydrogen tank, and the engine section) will be assembled into two half-stages first before the whole stage is finally connected while horizontal. 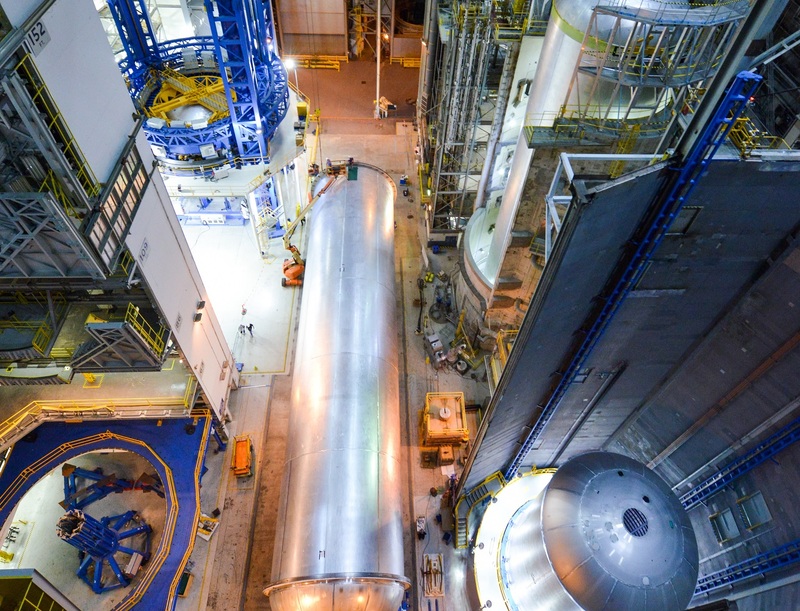 Along with the two half stages that need to be stacked to help complete the stage, the two remaining STAs (for the liquid hydrogen and liquid oxygen tanks) must be completed and shipped to their test stands at the Marshall Space Flight Center (MSFC) in Huntsville, Alabama. The current plan is to assemble the “forward join” of the CS-1 forward skirt, liquid oxygen (LOX) tank, and intertank first. Stacking the LH2 STA, which will connect the LH2 qualification tank with two simulators on other end, would follow shortly behind that. Bare metal propellant tanks fill the aisleway and processing cells in the Building 110 VAB at MAF, July 2017. A similar convergence of hardware could occur this Fall. From left to right, Cells A and D at the bottom will be used for upcoming “major joins” of the first Core Stage. The aisleway blocked by the long hydrogen tank in the middle here will be needed for access to those two cells and the VAC welding tool (upper left). Credit: NASA/Jude Guidry. 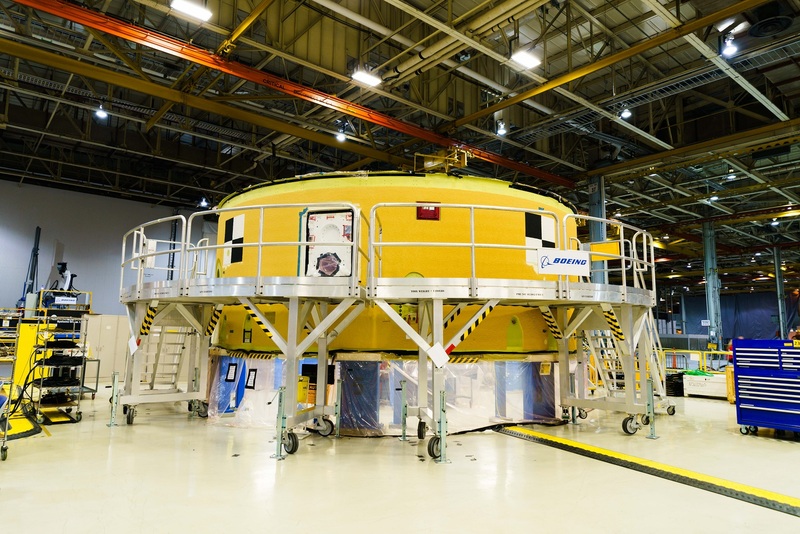 NASA and Boeing have two cells configured for vertical stacking/integration in Building 110. Cell A was originally configured for vertical stacking when Building 110 was initially constructed over 50 years ago; it has platforms at fixed levels. Cell D was converted into an integration cell for SLS, and has a single, movable platform that can provide access up and down the cell. The LH2 tank itself is over 130 feet long; while the tank can and does fit in Cell D by itself, there’s not enough clearance to get it out of the cell with anything else attached and possibly not even enough room to fit either of the simulators in the cell with the tank. An LH2 tank is also so large that it will block access to Cell A and Cell D for other hardware elements. “One of the challenges we have is managing traffic in the aisle way of Building 110, because stacking the qual articles — LH2 first, then followed by LOX — all those things consume the aisle space as we’re staging,” Steven Ernst, Boeing’s Core Stage Engineering Support Manager, said during a July interview with NASASpaceflight.com. “So it’s a bit of a dance, and getting the qual articles out of here and on their way to Marshall is a priority, so when can get through all of the testing and all of the data analysis and get through design certification review.” Simultaneously, getting the first vehicle completed is also a priority — it’s in the critical path for the EM-1 launch. Schedules change frequently as the workforce progresses through the first-time learning curve and Boeing is constantly monitoring work developments on the different assemblies to see when each of them becomes ready. 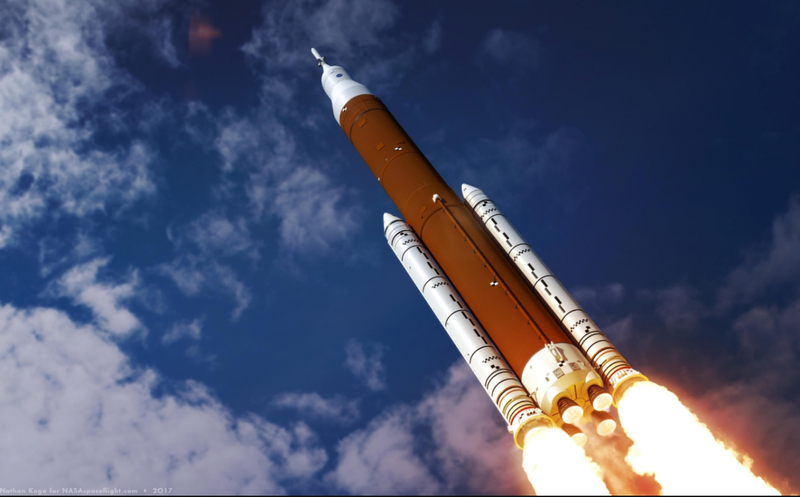 “The reason it’s fluid and we do it on purpose [is because] it’s first-time operations,” Rick Navarro, Boeing’s Director of Space and Launch Operations, explained. The review of all the testing was completed just prior to speaking with Navarro in early July. “The review [was] called break of configuration, where you go over all the test findings and make sure you understood it all and it’s all explained and dispositioned, and we had the official word to break the test configuration last night, so we’re done,” he noted at the time. CS-1 forward skirt standalone work is complete at MAF, July 2018. First completed, the ring will be the last of the three pieces added to the “forward join.” Credit: NASA/Eric Bordelon. The first to reach that point, it will be the last to be stacked, going on top of the LOX tank at the end of sequence. Following functional testing, four checkerboard photogrammetry targets were added around the circumference. The CS-1 intertank is one step behind the forward skirt. The element is fully outfitted with its own systems and began its own subassembly-level functional testing in mid-July to verify everything inside is connected and operating properly. One of the last major pre-test steps was to install the flight avionics boxes into the intertank. “After we tested the harnesses individually, then we removed the placeholder 3-D printed boxes and put the actual avionics boxes [in],” he added. For the functional testing, the Boeing team is running some of their test cables through systems tunnel connectors to plug into the network of components inside the intertank. Full-up, end-to-end systems checkout will occur later after the systems tunnel itself is attached to the whole stage in the Final Assembly area. Navarro also noted that the additional development flight instrumentation (DFI) on the first vehicle adds to the length of the checkout. “A significant part of the testing is all the sensors [and] first time flight instrumentation,” he said. -Z side of the CS-1 intertank at MAF, August 13. Credit: Philip Sloss for NSF/L2. Once they are given the ‘go’ to disconnect all the test cabling, the intertank will be closed out to be taken into Cell D next month for final pre-stacking steps ahead of bringing the LOX tank in and connecting it to the top of the intertank. In parallel with the intertank functional testing, technicians are going through the pre-stacking steps for the LOX tank. Primary spray-on foam insulation (SOFI) work on the CS-1 LOX tank in Cell N was completed in June and the tank was moved back to Area 6 in the main building at MAF, Building 103. CS-1 LOX tank in Cell A at MAF, August 13. From a “LOX bridge” platform/clean room set up at the top of the tank, two technicians are to be winched down through the forward manhole to the bottom to torque one series of fasteners inside the aft dome while others are tightened on the outside. Credit: Philip Sloss for NSF/L2. A series of small, circular sensor islands were masked off prior to foam sprays to allow for later access; in Area 6, the development flight instrumentation (DFI) sensors themselves were added to the islands and connected to their wiring runs. The sensor islands are similar to “DFI islands” flown on the first six Shuttle External Tanks. The earlier plan was to completely finish testing and checkout of the sensor islands, install an internal sensor mast, and then put the LOX tank into Cell A for installation of the LOX tank sump; however, delivery of the sensor mast was delayed, which prompted Boeing to bring the sump install forward. The salad-bowl shaped sump cover fits outside the outer mold line of the tank’s aft dome, but the inside of the tanks have to be kept clean and environmentally controlled, so the technicians going into the tank will have to do their work while suspended. 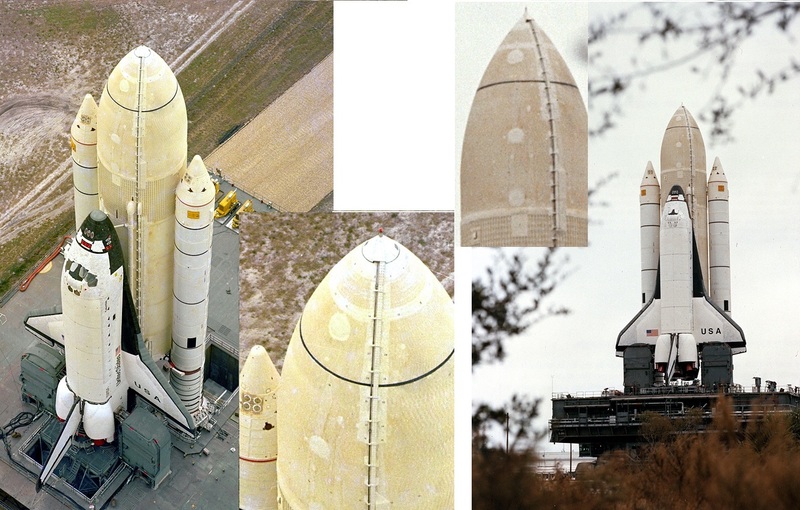 Circular DFI islands can be seen on the top of the External Tank for the STS-1 Space Shuttle vehicle in two images taken during its rollout to the pad on December 29, 1980. The first SLS Core Stage will have similar sensor islands on both its cryogenic propellant tanks. Credit: NASA. After the sump is installed, the tank will return to Area 6 to install the sensor mast and finish up remaining sensor closeouts. “We can’t do it in the vertical, we don’t have the access to do the sensor mast, so we’ll come out [of Cell A], break over [to horizontal], go back to Area 6, get the clean room entry [set up], get the sensor mast installed and some other minor work we’ll do other there and then we’ll be waiting to come back here to Cell D to stack on top of the intertank,” Ernst said.